Miranda did not put adventure on her Christmas list, but thanks to her eighty-five-year-old neighbor Joy, that’s exactly what she’s getting this year. 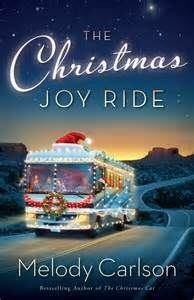 When Joy tells Miranda that she plans to drive an old RV decked out in Christmas decorations from their Chicago neighborhood to her new retirement digs in Phoenix–in the dead of winter, no less–the much younger Miranda insists that Joy cannot make such a trip by herself. Besides, a crazy trip with Joy would be more interesting than another Christmas home alone. Unemployed and facing foreclosure, Miranda feels she has nothing to lose by packing a bag and heading off to Route 66. But Joy has a hidden agenda for their Christmas joyride–and a hidden problem that could derail the whole venture. No one captures the heartwarming fun of the Christmas season quite like Melody Carlson. Fasten your seat belt, because it’s going to be an exciting ride! I really enjoyed reading this book. Christmas is a big thing in my family so with Christmas in the title, I knew it was a book I was going to like. Christmas Joy is a sweet elderly lady who loves to blog and give to people. This is a story of giving, selflessness, and companionship with a sweet side of romance added in. Like a lot of books, romance is not the main subject in this book which was kind of refreshing. I still enjoy my romances, but sometimes a breather is a good thing! Reading about Miranda and Joy made me think that it would be fun to take a road trip in a motor home. The story was so funny and lighthearted. I laughed, cried, and smiled all throughout this book. If you like Christmas or just want to hear a story about an 85 year old lady driving a motor home, you should read this book. It is only about 165 pages so it only took me a couple hours to read! I received this book from Revell Reads in exchange for my honest review. I give this book a 5 out of 5 stars. Previous postHappy Halloween! Go to Sonic today!